Opower has been growing rapidly over the past few months and has been hiring at both its offices in Arlington, Va. and San Francisco. “The next 18 months will be a very interesting time for Opower,” as the company continues to grow, and will be introducing new products said Opower’s Vice President of Strategy & Marketing Ogi Kavazovic in an interview at Opower’s office in Arlington. Opower will launch an app with Facebook next year and recently launched a connected thermostat with Honeywell (s HON). Opower develops software and analytics to enable utilities to connect with their customers and get them to reduce their energy consumption by around 2 percent. The initial product from Opower is software that creates detailed mailed energy bills that give feedback to utility customers, like if they used more energy than the average, and offers suggestions for how customers can change their energy consumption behavior. Opower now offers other digital ways for utilities to connect with consumers via email, text, utility websites, and soon Facebook and a connected thermostat. As we’ve pointed out before, Opower is essentially a big data company, and crunches utility energy consumption data to deliver feedback to consumers and utilities. Opower estimates it will be able to help save one terawatt hour worth of energy collectively from U.S. homes by the end of 2012. 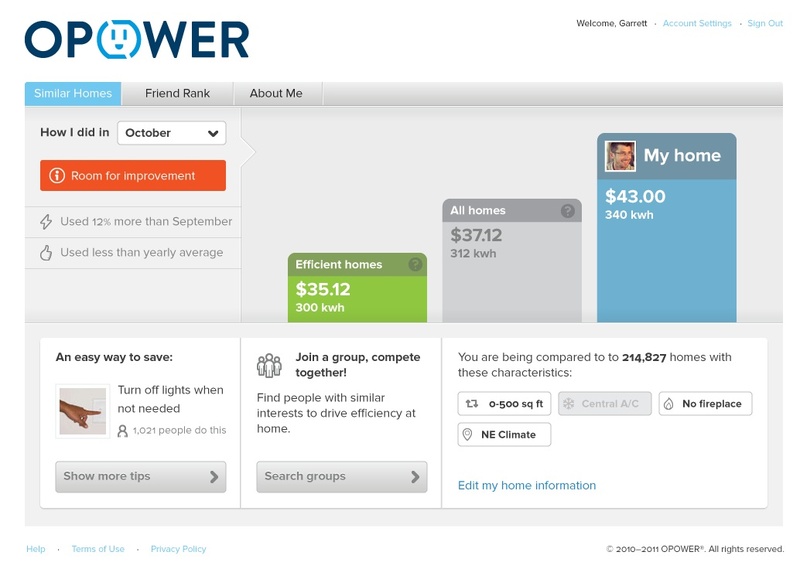 Opower is backed by at least $64 million from venture capitalists including NEA, Kleiner Perkins and Accel Partners. An IPO down the road would provide a liquidity exit for Opower’s investors and early employees. Opower has passed on acquisition offers and intends to grow into a large company. At what point down the road will be a good time for an IPO for Opower remains to be seen. The window for IPOs has seemed to be closed in recent months due to the macroeconomic climate. Smart grid company Silver Spring Networks filed to go public this summer, but has yet to debut on the public markets. Both Opower and SilverSpring Networks are hiring a lot, so I suppose they’re growing staff, if not sales. They’re going very fast through the massive amount of venture capital they raised, and the next step for them to raise money is the public, not private capital (it would probably be a down round…). OPower has over 60 current jobs openings and has advertised almost 200 jobs since January 2011. Silver spring Networks has only 14 current job openings, but has advertised 140 since January 2011.